Purchasing presents for a newborn baby can be a challenge if you haven’t been there yourself! With so many options now-a-days it’s tricky to know where to start and what might be truly needed or appreciated (though fyi: cookies are always needed!). If you’re stumped for what to buy for the new baby check out the ideas below! Buying presents for a new baby can seem overwhelming when there’s so much to chose from. While there are always some items parents will need for the new baby (see “The Obvious” section) there are also a lot more gift options to go with! Instead of letting you scramble around and learn all about new babies and their needs, I threw together this quick roundup of baby items that make perfect gifts! These are all items I had and loved so I hope it at least gives you some inspiration! There are three different categories depending on what you want to go with so scroll through and enjoy! And of course- any suggestions are welcome! These are some of the products that we found most useful or appreciated the most and I hoped to pass them along. These gifts are standards that just about every parent needs. They’re not fancy but they are practical! You can almost never go wrong with diapers. Seriously. Since parents will be going through a zillion of them, showing up with diapers in hand is always an amazing idea! And if your new mama is rocking cloth diapers (which is a great idea because there’s so many reasons to), grabbing them a few diaper covers is always a super sweet gesture! 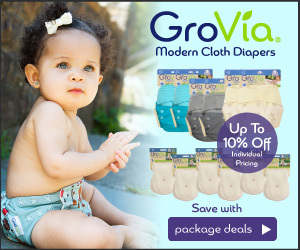 Apple Cheeks (which you can grab at well.ca) and Grovia are our go-to brand. While parents don’t need a zillion of these, having a few really good ones come in hands. We personally loved the bamboo blankets because they were both super long and super light. Especially for summer months, the bamboo blankets are genius. I love these blue ones or these pink ones. Most parents will at some point go with a sleep sack instead of a swaddle blanket as their baby begins to grow! We liked this one because my daughter absolutely refused to have her arms contained after the age of eight weeks. Getting little newborn hats are just cute. Always. And since most heat escapes through the head they’re a smart choice. Clothes are always a good choice but my advice would be to think ahead! It’s nice when you have a variety of sizes so that you’re covered as your baby grows. Even if the mama is bottle feeding, the pillow helps! It gets used for far more than feeding and ends up helping to support the babe when sitting. There’s a host of things you can grab for newborns that the parents will appreciate: a thermometer, nasal aspirator, bath toys, towels, a humidifier etc. While many people focus on the baby will need immediately, it’s also nice to receive gifts for a little bit later on. When baby is moving, making noise or starting to teeth. We have all of the items below and my little girl loved them. These kinds of books are perfect for exploring babies as they get so excited at what it underneath! It’s cute watching them. Around six months both my daughters started to love opening the flaps and I ran around like a crazy person trying to grab all sorts of books! These books are also still hard enough that they can take a slight beating without completely falling apart. The below books were easily some of my daughters favorites from about 6 months old to 2 years! Baby bear was never one for the munch mitt or sophie products (which we have both of, of course). But she did- and does- absolutely adore teething beads! You can buy pre-made necklaces or kits to make your ownbut we literally have these beads everywhere in the house. They work wonders. Puzzles are always a great gift for little hands! We personally like the sound ones from Melissa and Doug (like this animal one) but when she was a bit smaller we opted for puzzles with big knob handles to make grabbing them a bit easier. These chairs are golden for new mamas because they give you SOMEWHERE to put the baby! My littles ones loved snoozing in this chair and it was a life saver to me. While gifts for the baby to survive, learn and develop are great, it’s also nice to have some thoughtful gifts for your newborn too. Below are some great ways to record memories of your little one. I truly didn’t think I’d want something like this but to be honest, they do grow far too quickly and having the reminder of how little they were is precious. With everything all about social media these days this chalkboard is super cute to track baby’s milestones and monthly progress! I like that it’s premade and all you have to do is fill it out. If you’re a craftsy person, please do this. For baby bear my girlfriend made me a scrapbook that was already half fileld out and I just had to ad pictures. It was beyond thoughtful. I’m not a scrapbook person so it was so amazing to have it all done for me. I love looking at it with baby bear still- it’s a beyond thoughtful gift if you have time. Here’s some great girl and boy kits. Baby wearing ROCKS. 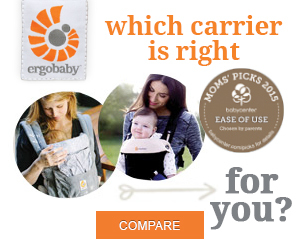 Not only is there so many benefits to baby wearing but it gives mama some hands free time to actually get sh*t done. Plus, if there’s even a glimmer of more kids it will literally save the moms sanity. I have both the ergo carrier and the Ka’tan one. The ergo I love when the kids are a bit bigger but the ka’tan I rocked while my girls were young. It’s simple to put on and snuggles them close. Don’t forget to pin these awesome gifts for babies! If you’re struggling with what to buy for a new baby, here you are! These gifts are practical, thoughtful and perfect for any newborn (and the parents of course!). Take the stress out of guessing and opt for something you know the baby will need or the parents will love. Someone got my mom learning puzzles for me when I was a tot and she was so grateful because she never even thought about those. She was always concerned with grabbing the necessities. It’s nice to have fun things too! Most people only thing about the necessities but it’s so nice having a stash of other stuff ready and waiting! These are all great! My sister just had twins so I may have to use some of these ideas! Ahh twins! Pass along my congrats- enjoy baby snuggles! Some great ideas for gifting. Thank you. It’s been a long time since I’ve had to think about little ones! The lift the flap books are a great suggestion! I love the board book ones that are extra sturdy! This is so helpful for putting together my registry – I’m so clueless about this stuff! I’m so happy I could help! I was clueless with my first too- not to worry. Congrats by the way!! A lot of my friends are having kids so I find myself in the baby aisle of Target often. I always go for Diapers and then one fun little thing like a rubber duckie. Ahh I love the light “muslin(? )” ones! You;re right- those ones are pretty awesome. And even better if you have summer babies! This is a pretty awesome list for a newborn. And you’re right, if you’ve never had children. You wouldn’t know. This is really helpful. ?? Thank you! Great gift ideas for newly parents and their little ones! We always give gifts for the future. I find that parents always end up with more than enough gifts for the stage the child is in at the moment that giving something for the future is always a good bet. Aww, these are really cute ideas! I just saw a newborn patient today and she was super cute! I bet her parents would love all of these! Aw- they are super cute when they’re teeny! You forget how fast they grow though!